Haunted Houses in Lancaster, Pennsylvania PA are some of the scariest haunted houses in America. Hauntworld.com tries to review only the best haunted houses in Lancaster, Pennsylvania, PA. When you are looking for simply the best, scariest, haunted houses in Pennsylvania PA there is no other place to search than Hauntworld.com which offers our guests the best information to find Pennsylvania PA Haunted Houses including the best haunted attractions in Lancaster, Pennsylvania PA. There are many haunted houses in Lancaster that claim to the best haunted attraction but only one can truly lay claim to the being the scariest haunted house in Pennsylvania... 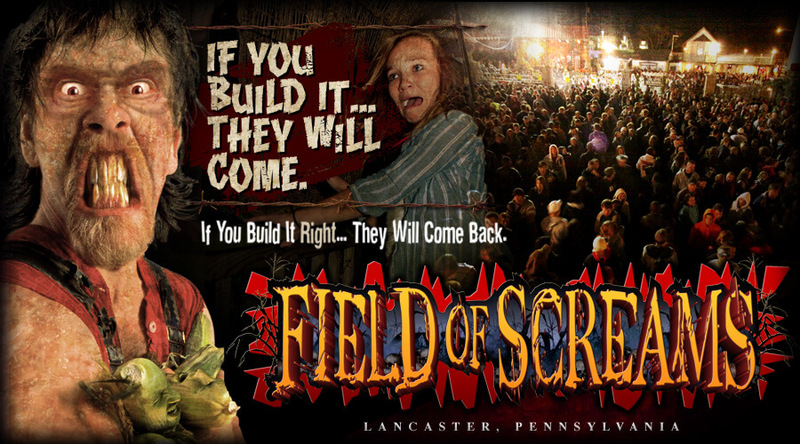 The Field of Screams Haunted House in Lancaster, Pennsylvania, Pa. Among the hotbed of haunts in Eastern Pennsylvania, in the small town of Mountville, lies the legendary Field of Screams Haunted Attraction. Don’t be surprised by the tiny size of the town though. Field of Screams has proven that no matter how small your population, if you have a world class haunt, customers will drive for hours and states away to attend. While we were there, we spoke with customers from all over Pennsylvania, New York, Baltimore, Philadelphia, Delaware, New Jersey and Washington D.C. Many of these people said they have been visiting Field of Screams for 10 years or more. Field of Screams has positioned themselves as a destination, not just your typical neighborhood haunt. 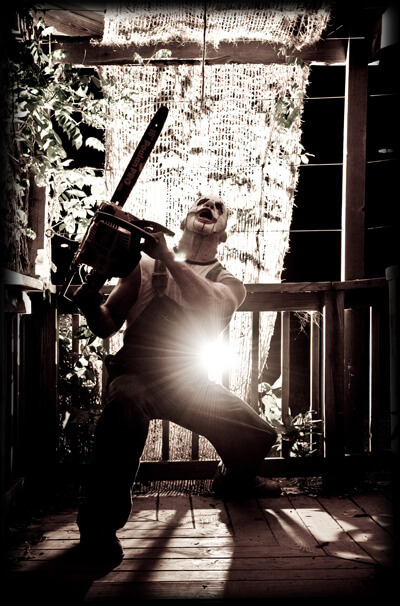 Known as one of the leaders in the Haunted Attraction industry and the recipient of national acclaim, the name Field of Screams has been synonymous with the Schopf Brothers’ passion for the industry to which they have dedicated their lives. In this industry we all know that there are imitators out there but Field of Screams in Mountville, is THE Field of Screams and not to be missed! Field of Screams is truly a world class operation, and as no surprise to us and our readers I’m sure, Hauntworld has once again ranked Field of Screams as one of the Best Haunted Attractions in the world. It’s the one and only Field of Screams and it’s the real deal. From the moment you step out of your car until you are chased back to it by the chainsaw wielding “Jack the Clown” you will be impressed. The attention to detail and the work and thought that Field of Screams puts in during the off-season is very evident as we approach the ticket booth. That’s right; we were beginning to be impressed even before we saw any of the haunts! The signs and theming were very elaborate and professional looking. You get the feel right from the start that “this is legit” or “Man, we are at an amusement park!” The ticket booth had 10 windows, in other words they are well prepared for nights when they need to process 10,000 patrons! Amazingly, there are hand-laid pavers from the ticket booth the whole way to each nicely themed attraction entranceway. Right from the start you get the feel that you have arrived at a premier haunted attraction, one that isn’t like all the others, one that has put itself on a pedestal to which all other haunts aspire. The string lights towering over the customers, the 6 food trailers, games, novelty shop, bands, competitions, the “ghost host” emcee, and other professional employees all put together gave us a great taste right from the start. We immediately realized that Field of Screams is much more than 3 Haunted Attractions. 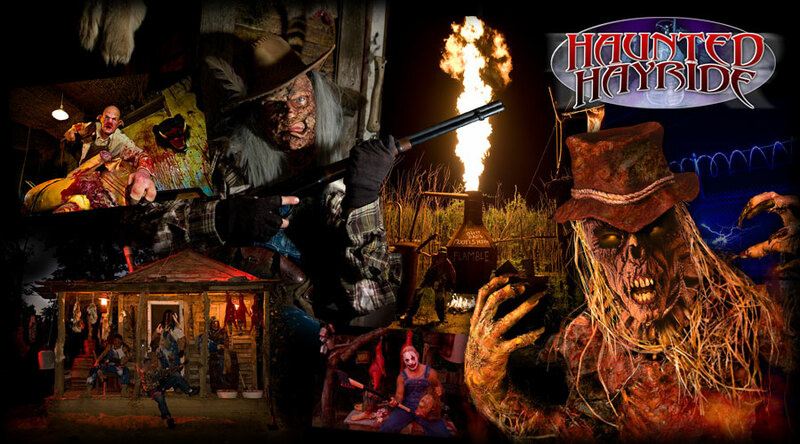 As you travel down the paver path following the impressively themed, skeleton clad, directional signs you have your choice of venturing into the Den of Darkness, The Frightmare Asylum, or the Haunted Hayride. We chose to begin the attractions portion of our experience with the Haunted Hayride. It seems that Haunted Hayrides are more prevalent in the Eastern part of the US. If you currently have a haunted hayride or are thinking about having one, the Field of Screams Hayride is a “must see” attraction. Packed with special effects, large scale scenes, and high dollar effects, we stood in awe and amazement at the end of the ride. From beginning to end it was truly an unforgettable ride. This hayride had more action at nearly every scene than some entire hayrides that I’ve been on. The hayride alone has over 75 pneumatics and 250 scare points. Pneumatics, action, and eye candy abound on the Field of Screams Haunted Hayride. You may think that this means Field of Screams skimps on actors. However, this is not the case. We have never seen so many actors at a Halloween attraction. Located on the Hayride, the clown barn alone has 15 clowns. These 15 clowns are accompanied by 10 pneumatic props including a home-made confetti launcher, a submachine gun, bubble machines, snow machines, and foam machines. There are smell canisters sending aromas into the air of cotton candy and popcorn, clown horns for props, a detailed light show, and clowns coming out of the ceiling on fire-poles. All of this and more made us feel like we actually entered an abandoned psycho circus! The whole scene starts with the tractor and wagon pulling into a 30 by 50 building morphed into a circus tent. The doors close on both sides trapping the wagon inside the carnival area of carnage. Next, a news report begins to broadcast on a big screen TV warning trespassers to stay away. This news report was produced per gratis by Fox 43, one of the largest TV stations in the area. FOX 43 realizes the benefits of being associated and teamed up with a mega haunt such as Field of Screams. Gone are the days of paying for radio stations to bring their van to these types of mega-haunt events. Now sponsors realize the importance of teaming up with large haunted attractions such as Field of Screams and are willing to pay or provide their services in order to be associated with them. However, Field of Screams does not just take in all they can get, they are also very giving. 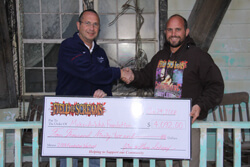 Field of Screams has donated over $50,000 to charities. One of their longest running charitable ties is with their local Boys Club and Girls Club. Other charities that benefit from the success of Field of Screams are The Ronald McDonald House Charities, The Sheetz Family Christmas, The Rutters’ Children’s Charities, The Make a Wish Foundation, and numerous local non-profit groups. The Schopf Bros. feel it is very important to give back to the community and said it’s a good feeling to know they are making someone else’s day brighter. Don’t be fooled by this Jekyll and Hyde facade because their main focus and goal is to scare the living daylights out of you, and they’ve got that down to a science. The Field of Screams team has the haunted attraction scene all figured out from dynamic marketing, set design, construction, atmosfear of the Theme Park, throughput, costumes, data collection, and just plain down putting on one of the best shows in America. We are always impressed with this place and one of the most amazing facts is that this all started with 2 brothers and a little idea for a hayride. Continuing our trip through Field of Screams, we decided to tackle the Den of Darkness as our next attraction. As you approach the Den of Darkness, the themed façade immediately sets this attraction apart from others. One of the advantages Field of Screams has is that it is permanently located on the family farm and the attractions stay up year round. This means that all year the Field of Screams staff can add props, scenes, and details. The Den of Darkness looks like an old creepy hotel. It is actually a 160 year old barn which adds to the incredible uniqueness found inside the Den. The highly detailed façade work on the outside of the Den is backed up inside with a high intensity, high energy show. Tons of special effects and lots of trained actors are used in this attraction. Actors are in highly detailed costumes, in position, using skit lines, and are ready to pounce on their prey to achieve a great scare. One of the rooms you will experience is the kitchen which you could say approaches sensory overload. Pots and pans flying overhead, monsters going in and out of cabinets, freezers full of “steaming” body parts, smells of meat, a haunted stove, and of course the insane cook coming out of the fridge will make even the bravest of souls cower in fear. Field of Screams does not put all their resources into one room, however. This level of mayhem is repeated room after room. It seems like you will never get out. The excitement and terror goes on and on. Almost every customer runs out of the Den of Darkness screaming in fear and at the same time relieved that they made it out to safety. The fear soon turns to laughter and conversations within the group about what parts were the most amazing to them. I think we may have saved the best for last! Our final attraction at Field of Screams was the Frightmare Asylum. Once a 3D Haunt, the Frightmare Asylum was converted into a full blown Haunted Hospital several years ago. Themed from basement to the attic, the Frightmare Asylum is 4 floors of the demented and the deranged. The basement was full of aggressive actors, authentic medical equipment, and very unique scares and scenes. The patients, or actors, were extremely convincing and even made us jump several times. From the crazed Doctor trying to inject us with one of the syringes from his collection to the examiner conducting the autopsies, we were treated to sights, sounds, and smells that will haunt us for life! We have been to haunts all over the world and Field of Screams is at the top of our list.